Founded in 1899, V.F. Corp is a leading global lifestyle apparel maker in the outerwear, footwear, denim, backpack, luggage, accessory, sportswear, occupational, and performance apparel categories. Close to 70% of the business is sold on a wholesale basis to retailers, and the remainder is sold direct-to-consumer (VFC owns approximately 1,500 retail stores and maintains a significant e-commerce presence). The company owns more than 30 iconic brands, including five with sales in excess of $1 billion per year (Vans, The North Face, Timberland, Wrangler, Lee). Geographically, V.F. Corp is very global with close to 40% of its sales generated outside of the U.S. In order to pay fast-growing dividends for nearly half a century, V.F. Corp needs to have a steadily growing business and a number of competitive advantages. 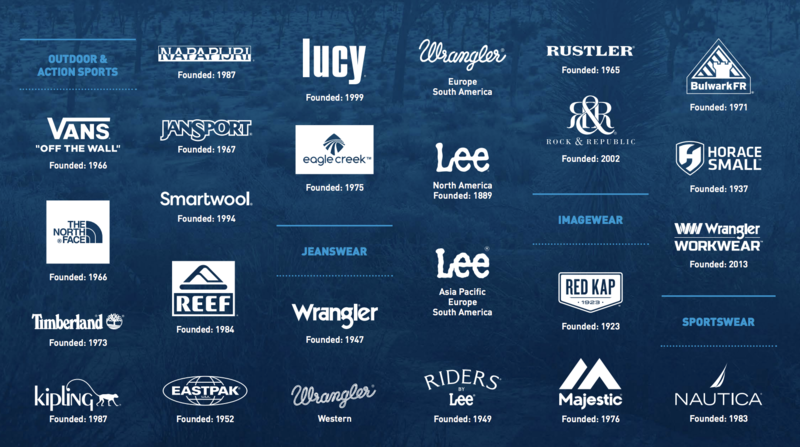 First, many of the company’s largest brands have carved out leading mindshare with consumers in their respective product categories because they have delivered quality for so many years – The North Face (1966), Vans (1966), Timberland (1973), Lee (1889), Wrangler (1947), Eastpak (1952), Red Kap (1923), Nautica (1983), Jansport (1967). Strong brands help V.F. Corp charge more for its products and maintain prime shelf space with retailers, who need VFC’s products to draw in traffic; consumers expect them to have North Face, etc., and might shop elsewhere if they don’t carry those brands. While V.F. Corp has had to evolve its products’ designs and marketing strategies over the years, its long-standing brand recognition and successful relationships with retailers (there is only so much shelf space for each product category) serve as major competitive advantages. To stay relevant, V.F. Corp invests significantly in advertising (over $600 million annually, representing more than 5% of sales) and consumer research. V.F. Corp realizes that developing a deep understanding of consumers’ needs must be at the core of how it designs and markets products to win customers’ loyalty. Over the past five years, for example, V.F. Corp has conducted thousands of in-person interviews and surveyed more than 125,000 people in 15 countries to gain better consumer insights. The best brands create strong, emotional connections with consumers, and VFC has proven time and again to excel at this objective. V.F. Corp’s supply chain is another advantage. The company produces more than 500 million units of apparel, footwear, and accessories every year, representing hundreds of thousands of combinations of style and color. Close to 30,000 of V.F. Corp’s employees support supply chain activities, and retailers require timely fulfillment of quality products that will sell. Unlike some of its competitors, V.F. Corp also manufactures roughly 25% of its own products (the other 75% are outsourced to third parties). Products manufactured in VFC’s own facilities have lower costs and shorter lead times. The company’s scale and in-house work help it maintain very competitive production costs and supply chain reliability that smaller players would struggle to match. The company’s long-term focused management team has spent decades carefully acquiring and expanding its portfolio of active lifestyle brands that successfully compete in a global market that represents $515 billion in annual sales, according to Morningstar. For example, the company’s iconic Wrangler jeans have the largest market share in its industry at 23%. Of course, because the apparel and retail industry is highly discretionary and marked by changing fashion tastes over time, sales, earnings, and free cash flow growth have their ups and downs. V.F. Corp has struggled with falling traffic at U.S. department stores and combatted sales declines in its core denim and sportswear categories, which were perhaps driven by changing consumer fashion trends (e.g. the shift from jeans to yoga pants). While Wall Street has been focused on the company’s relatively poor recent top and bottom line growth and lack of homerun acquisitions (VFC’s last large deal was its $2 billion acquisition of boot maker Timberland in 2011), investors need to keep in mind that part of running a successful apparel company means managing the brand portfolio. For example, VFC sold its contemporary brands coalition in 2016 for $120 million in order to focus on faster-growing and higher-margin business lines, especially the action sports business. Importantly, V.F. Corp has a very good track record of not only focusing on the most iconic brands but also in strong overseas expansion, especially in fast-growing emerging markets such as China, where the middle class is expected to expand by 300 million people by 2021. So while VFC’s core U.S. business may be growing very slowly, the company has been successful in winning market share abroad, as well as with professionals, who generally tend to be less price sensitive and more brand loyal. The company's August 2017 acquisition of workwear company Williamson-Dickie for $820 million should help in this market. Just as important, its direct-to-consumer (DTC) business, which accounts for more than 30% of sales, is growing strongly, especially the digital (i.e. online) unit. This means that VFC’s business is likely doing reasonably well competing with Amazon (AMZN), and its business should be able to adapt to the rise of e-commerce that is proving to be such a disruptive force for many other traditional retailers. As DTC continues to account for an increasingly greater share of overall revenue, it shows that V.F. Corp can likely continue growing into the future with a smaller emphasis on brick-and-mortar stores. Going forward, management has outlined a long-term growth strategy it calls V.F. Corp 2021, which is focused on four key aspects. Specifically, the company is looking to optimize its advertising into its top selling, fastest growing, and most profitable brands, notably its outdoor and actions sports lines such as Timberland, Vans, and North Face. In addition, the company plans a more aggressive push into Asia, especially China, which is by far its fastest-growing and largest potential market. Next, V.F. Corp will work towards increasing its DTC business, thus moving away from wholesale retailers with aggressive investment into its online sales channels, which are registering strong double-digit growth. Finally, the company plans to continue optimizing its economies of scale in its supply chain and manufacturing base to help achieve further long-term margin improvement. Overall, V.F. Corp’s reputation for quality, strong portfolio of brands, long-standing relationships with retailers, and skill in navigating a competitive landscape marked by constantly evolving consumer preferences form the foundation of its successful business. There are three main risks to focus on with V.F. Corp.
First, all apparel makers are ultimately at the mercy of fickle consumer tastes, especially when it comes to high priced clothing. For example, North Land parkas often sell for $289 while Vans sneakers usually retail for $60 and up. Thus V.F. Corp’s future growth potential relies on U.S. and increasingly global consumers remaining loyal to its brands and being both willing and able to afford its high-margin merchandise. Similarly, increasing consumer preferences for experiences over goods and digital shopping has made for a challenging brick-and-mortar retail environment, especially in apparel. If consumers were to lose interest in the outdoor, action sports, and jeanswear apparel categories, which account for nearly 80% of V.F. Corp’s revenue and contain the firm’s biggest brands, the company’s growth plans would be challenged. While these are certainly clothing mainstays, consumer preferences could still evolve within these categories and favor new brands or styles that emerge. It wouldn’t hurt if VFC had greater brand and product category diversification, but the company’s existing brands have shown remarkable durability over many decades of time. Risk is also mitigated somewhat by management’s ability to grow or acquire new brands and plug them into the company’s existing distribution network. Another risk to consider is currency fluctuation, especially the risk of a strong dollar, which can act as a headwind to the company’s overseas growth efforts. That’s because VFC’s sales abroad are in local currency, so if the dollar strengthens than those local sales convert to fewer U.S. dollars for accounting purposes. This risk can impact short-term results but seems unlikely to impair the company's long-term outlook. In addition to currency fluctuations, V.F. Corp’s business can be affected over the short-term by shifts in consumer spending, weather, raw material costs (e.g. denim), and inventory management issues. However, none of these risks seem likely to threaten the company’s long-term earnings power either. Finally, realize that, historically, V.F. Corp’s strong growth has come on the back of disciplined, well executed, and sizable brand acquisitions. Going forward, there is no guarantee that management will be able to locate sufficiently high-quality and profitable buyout targets to continue this trend. As a result, the company might end up falling short of its growth targets, which would likely mean slower dividend growth and poorer total returns going forward. Few industries can be as hard to invest successfully in as retail, thanks to unpredictable fashion trends, the cyclical nature of the business, and the potential disruptive threat of e-commerce. However, V.F. Corp's long-term, conservative approach to investing in a portfolio of top brands, overseas market expansion, and online sales makes it one of the few retail-focused firms that dividend growth investors can likely count on for continued income growth and reasonable total returns. When combined with its conservative balance sheet and strong free cash flow generation, V.F. Corp should have no trouble continuing to raise its dividend, just like it has every year since 1973.